With a name like Joker Gems you might expect this new release from ELK Studios to be a classic fruity. Instead, it’s a futuristic looking space-themed slot that comes with simple, volatile action and a shot at landing a jackpot prize of £50,000. 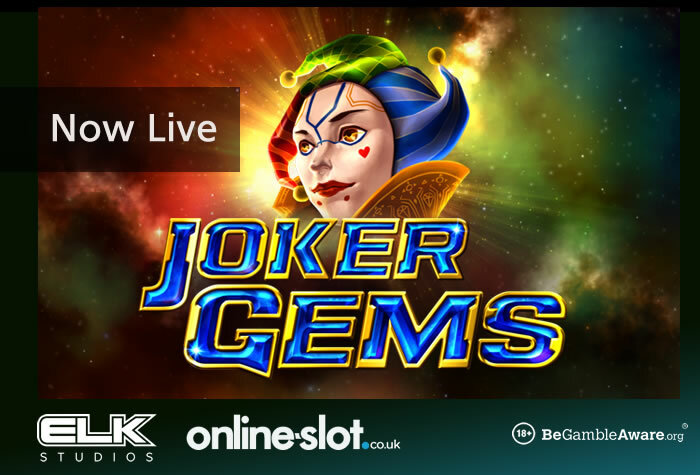 ELK Studios puts plenty of effort into making visually arresting slots and Joker Gems is another good looker. You’ll see the beautiful clouds of a space nebula in the background and a selection of gemstone symbols on the 5×5 reel grid. More rewarding are the bar and joker symbols who are joined by a female joker which is the wild. Winning combinations are created by landing clusters of 3 or more matching symbols. Rather than blasting away, these symbols are held and a re-spin follows. The re-spins continue as long as a new matching symbol or wild joins the original winning cluster. The size of the payouts on offer in Joker Gems varies massively. The minimum payout stands at just 1x but a cluster of 16 of the top paying symbol will get you an out of this world payout of 700 times your stake! Helping your winning chances is the Light Chaser feature – this beam of light races across the reels and delivers a guaranteed winning cluster of 4 or 5 symbols. The re-spin then follows too. Joker Gems also offers a chance to win 1 of 3 jackpot prizes. Fill the middle 9 positions with the same matching symbol and you’ll pocket the bronze prize which awards £10,000. The silver jackpot is triggered by filling all 16 outer positions with the same symbol. This pays £20,000. The big one is the gold jackpot which awards £50,000 if you fill all 25 grid positions with the same symbol. You won’t find a huge variety of features here. There’s plenty of potential action on offer from the re-spins though. Straightforward it may be but Joker Gems is a volatile game. With its classy visuals, simple gameplay and potentially explosive extras, Joker Gems is a simple but entertaining slot, especially if you enjoy high variance games. You can play Joker Gems at LeoVegas Casino who also have plenty of other new slots like Novomatic’s Totally Wild, Pragmatic Play’s Peking Luck, Blueprint Gaming’s Napoleon Rise of an Empire and Play ‘N Go’s Rise of Olympus. Sign up now to get 20 no deposit spins on Play ‘N Go’s Book of Dead. Then there’s a 100% match bonus up to £300 plus 30 more Book of Dead spins on your first deposit.